You've found the “U.S. Landrace Pig Breeders” page here at Hobby Farm Wisdom! If this is the first time you have visited our site: Welcome! Landrace is a large breed of domestic pig that is derived from the original Danish Landrace and used primarily for pork production. It was this breed that allowed Denmark to become one of the leading bacon-exporting countries in the world. The American Landrace has a very long body with 16-17 pairs of ribs. 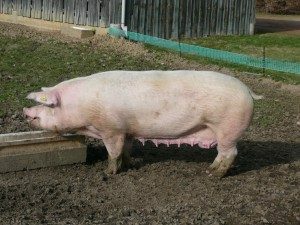 Their back can seem flat since it has much less arch than other pig breeds. All Landrace pigs must be white with no dark skin spots or black hairs; some minor freckling on the face is permissible. Landrace ham is considered plump but not overly fatty. These pigs are known for their excellent ability to successfully raise large litters. Landrace pigs are the fifth most popular recorded breed of pig in the United States.